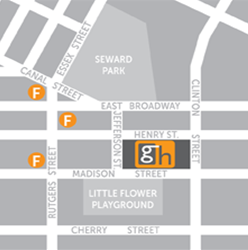 Gouverneur is one block away from the F train’s East Broadway stop. Exit at Madison Street. M15 Bus, or the M22 Bus. Gouverneur is located near the FDR Drive (Exit 3-South Street) and Williamsburg Bridge. Monday thru Friday, 9:00am-5:00pm with some services available on Saturdays, evenings, and early mornings. Please see the following schedule for your specific department. Gouverneur is closed on Sundays. We are a New York City public hospital and a member of theNew York City Health & Hospitals Corporation (HHC).